Right now, there’s a ridiculous amount of choice when it comes to C-segment hot hatches. If you have £30,000 or so to spend, where should your money go? If you want a new version of a past master, the Renault Megane RS might be for you. If performance trumps looks in your mind, there’s always the Honda Civic Type R and its mad love-it-or-hate-it aero bits and pieces. Then there’s the i30 N, which is bafflingly good considering Hyundai has no prior experience in this field to draw on. 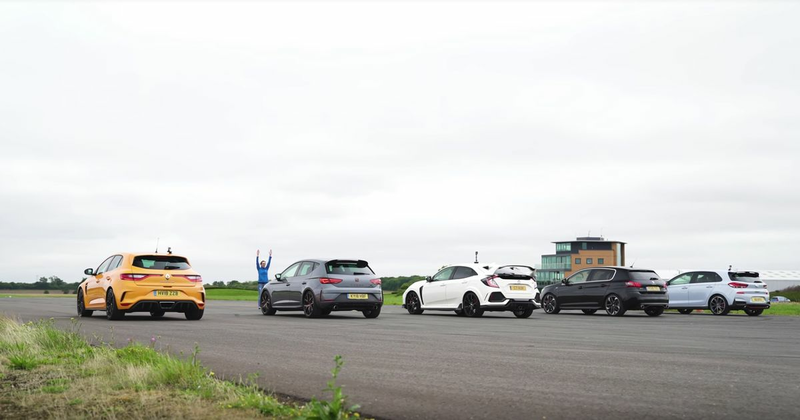 It’s certainly not a question you can answer with a simple drag race, but hey, we’re curious to know which front-wheel drive hot hatch is the quickest IRL. Helpfully, Car Wow’s latest straight-line battle involves those three contenders, along with the Peugeot 308 GTI and the Seat Leon Cupra R.
With 316bhp on tap, the Honda is the most powerful car here, but that doesn’t necessarily guarantee its victory. Hit play to see which comes out on top in the standing-start drag race, the rolling drag race and the brake test.